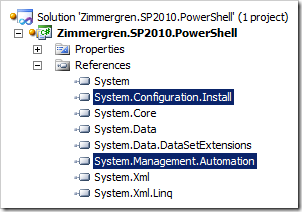 In this article I will talk about how you can get started with creating custom PowerShell commands for SharePoint 2010 that you can use. You will see how easy it actually is to build a custom class library that in turn is an extension to the PowerShell console and will add a couple of extra commands according to your preference. The reasons for wanting to do this is an endless list, but as an example if you’ve got repeated tasks you’ll need to perform that are not available out of the box, you can create them yourself and then use normal PowerShell scripts to execute your code. That way you can easily build your own custom commands (CmdLet) for PowerShell which basically extends the functionality to support whatever scenario you’ve got. You might remember that in SharePoint 2007 you could extend the STSADM.EXE command with something called STSADM Extensions. The approach I’m talking about in this article is pretty much the same concept – extending the build-in commands of your PowerShell console by adding custom code. 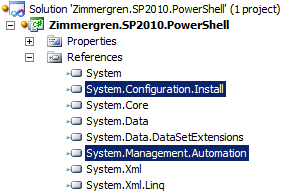 System.Management.Automation.dll file for PowerShell easily accessible. Start out by creating a new Visual Studio 2010 Class Library project and give it a proper name. In order for our PowerShell Cmdlet to work, we need to create an installer-class. This class is called when you install the SnapIn/Cmdlet and will provide the system with some information like where it comes from and what it’s supposed to do. This essentially provides some information to the system upon installation of your SnapIn. Now you need to continue this venture by creating a new class in your project. I named mine TestCmdlet1.cs. Since this is a generic Class Library-project, we need to create some kind of deployment script to make sure that our Cmdlet gets deployed when we build our project. "C:Program Files (x86)Microsoft SDKsWindowsv7.0Abingacutil.exe" -if "$(TargetPath)" "C:WINDOWSMicrosoft.NETFramework64v2.0.50727InstallUtil.exe" "$(TargetPath)"
In order to test our project, we now just need to build the Visual Studio project and the post build scripts will automatically hook up our assembly in the GAC and use INSTALLUTIL to install the Cmdlet. 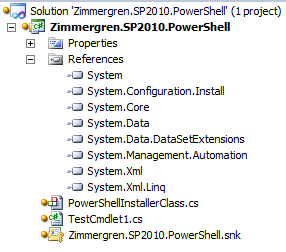 Great, our very first PowerShell cmdlet is created – and we have validated that it works! 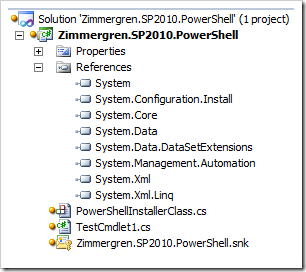 In this article we talked about how you create a general PowerShell Cmdlet in order to extend the capabilities in your PowerShell consoles. There’s no business logic incorporated in this sample, that’s up to you to implement in your projects. You’ve got the starting point to get sailing on the great PowerShell seas right here! 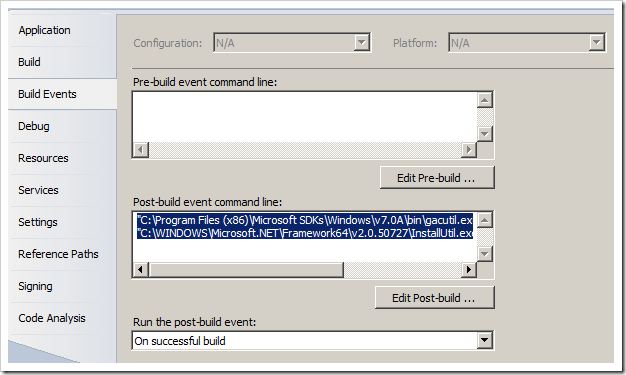 In my next article (Part 2) I will talk about the SharePoint 2010 specific details for creating a custom Cmdlet for your SharePoint installations. 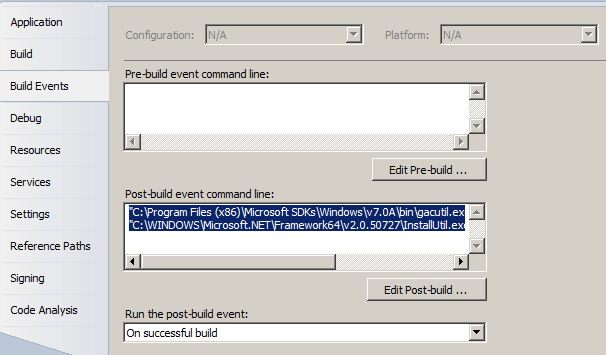 It will cover how you create custom Cmdlets to interact with the SharePoint 2010 object model in a nice way.